My grandfather survived one of the biggest disasters in coal mining history. I’ve been working on a project about Springhill, Nova Scotia for a long time based on what I learned about what happened to him and many other good men of Springhill. 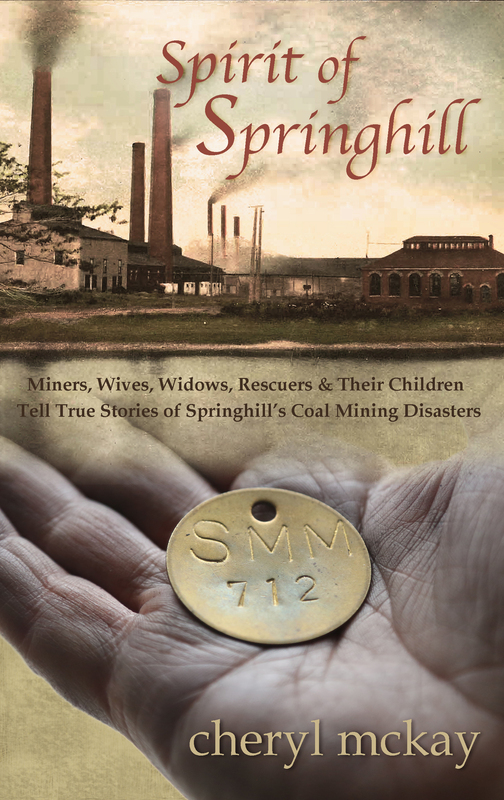 I wrote a screenplay called Song of Springhill, a dramatized version of the Springhill Mine Disasters. I am also currently penning the novel version. In the process of researching the story, I got the chance to talk to many wonderful people related to the disasters: miners who were miraculously rescued, their wives and kids, widows and children of those who were lost in the mines, and rescue workers. I’m releasing this book of interviews separately now while I’m still working on the novel. Spirit of Springhill is written in honor of this special town, and contains interviews with 16 men and women. It’s 132 pages. Special thanks to all who were willing to share their stories for this book and for the ways their stories have helped me work on the novel and screenplay. I’m honored to have met these wonderful people, some of whom have passed away since I interviewed them. My hope is this book is a way to share their legacies for generations to come. Spirit of Springhill is now available as a Paperback or an Ebook for Kindles, tablets, phones and computers. If you don’t have a Kindle, all you need is the free Amazon Kindle Reader software for your phone, tablet or computer to read it instantly. The ordering instructions for Paperback and Ebook are different, depending on if you’re in Canada or the United States. All other countries, check your country’s Amazon site for the Ebook. It may be a couple of months before the Paperback may potentially show up. I hope you are as inspired as I have been by the spirit of this special town that refused to give up on any of its own people, and the miraculous rescues that followed. I will continue to press forward with the novel version and announce once that is ready. Interested in learning about how to adapt a screenplay into a novel? There is a new trend percolating in the writing industry with novelizations. I’m not talking about serials that show up on bookshelves to match every episode of your favorite TV crime drama or the book spin-offs depicting your child’s favorite TV or movie characters. Rather, there is a different trend that began in the endlessly imaginative world of Hollywood around 2008. 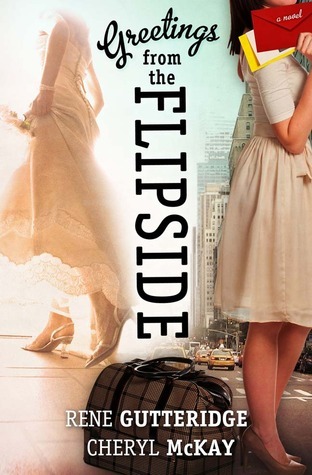 Most writers are familiar with the custom of taking a book and adapting it for the silver screen. That’s been around since Oliver Twist, Ben Hur, and Rip Van Winkle’s clever arrivals. But what is this reversal? Can we take screenplays—even before they are filmed—and turn them into novels? Can these novels have a life of their own, independent of a film or television release? The novelization process, as its own piece of artistry, is a whole different form of writing; it’s literally the opposite of book-to-screen adaptations and it’s gaining popularity. This topic that—just a few years ago, you’d never heard of—is suddenly on the roster of classes at screenwriting, film, and fiction writing conferences. Rene and I have even had the chance to teach some of those. We find this new trend exciting. Perhaps it’s because we had the privilege of getting involved on the front end of its newfound popularity before we had even heard of it. Our journey began in 2007. 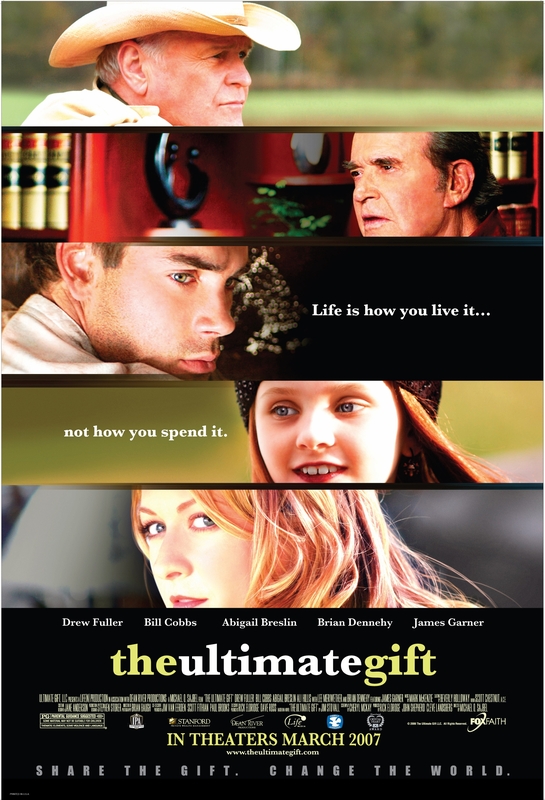 We met after Rene wrote the novelized version of my screenplay for The Ultimate Gift after it had been made into a feature film. What was unusual about that was the screenplay was already based on a book, penned by Jim Stovall. However, the producers and the publisher thought there would be value in releasing a second novel that closely matched the feature film. Rather than just rereleasing the original novel with the movie poster on the front, Thomas Nelson Publishers hired Rene to novelize my screenplay and then they published it in time for the feature film’s release. This creative process gave us a fresh idea. What if we could get publishers to commission novels based on screenplays, even if those screenplays hadn’t yet been made into films? If you are a screenwriter, can you imagine not having to wait for your movie to get cast, filmed, posted, and distributed to the nearest theater or Redbox to find an audience? Wouldn’t you love to start building an audience sooner? Now you can, with what we are going to teach you through this book. When Rene read my script Never the Bride, she knew she wanted my quirky rom-com to be the first story we worked on together. Our dream came true! 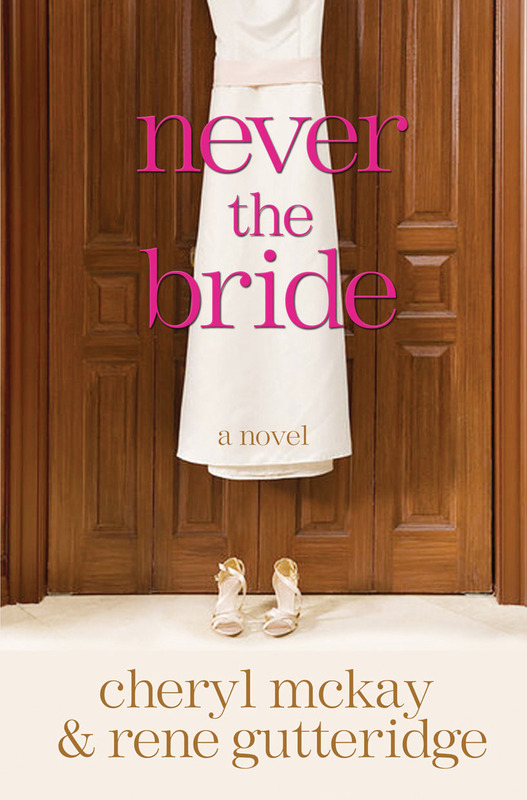 In early 2008, when this new trend was barely even a concept, Random House contracted us for the novelization of Never the Bride. Thus began the journey that has continued since that day. Collectively, we have seven of these in publication or soon-to-be released, and we plan to do more. We have learned so much about the script-to-novel writing process. We now want to share that with you. It is a different art form altogether from adapting books into scripts or writing novels from scratch. You may be wondering what the motive is for a screenwriter or a novelist to get involved in this process. For those writers who can do both forms of writing—why would you want to pen two projects based on the same material? The film industry is risk-adverse. Check out the slate of films releasing on any given Friday. You will notice most of these projects are based on something preexisting: a novel, a nonfiction book, a comic book, a character, a true story, a historical event, a sequel, prequel or spin-off of a prior film or TV series, a remake of a prior film. (Did you know Les Miserables has been adapted into film over ten times?) Hollywood loves to know they have a built-in audience with whom to start. Otherwise, they are too afraid no one will shell out the big bucks to fill their stadium-style theater seats. Yet screenwriters have good ideas for stories too, right? New, fresh, original. Naturally, not all screenwriters are novelists, just like most novelists wouldn’t know how to adapt their books into screenplays. (The writing rules couldn’t be more opposite!) In recent years, if executives came across a project they liked but they wanted to see if there was an audience for it, they might suggest the screenwriter get their project novelized and published first. Besides having your story published, the benefit for the screenwriter is to be able to take meetings with studios, TV networks, and producers, and talk about how her story sold first as a novel. This gives the impression that someone else considered that story worth buying. It will give that screenwriter a leg up on other scripts in the slush pile that have no track record. For novelists, this is a worthy world to dive into as well. They may find ideas they can be passionate about that will take half the work of an original novel. They have a better chance of their novelizations landing on the big screen. They have a shot at better sales if any of those novels are made into films and the novelizations rerelease with the movie posters on the front. All of this helps novelists become more visible in the film industry; it may call the attention of studios, networks, and producers to their other books. Can you say win-win? There are many questions surrounding this creative arena that we will discuss in this book. For example, how does a novelist know which stories to take on and which projects to avoid? Why is it important to not change everything the screenwriter wrote? And yet, how flexible does the screenwriter need to be when watching someone else adapt (read: change) his words? Screenwriters, we will help you understand why the novelist will have to make some changes to your beloved, original story, its structure, its dialogue, and other areas in the translation to book form. We will also share some tips on how to make sure you are working with a team that actually wants to adapt your story. • What are the challenges of novelizations? • What makes it easier to write these books over novels written from scratch? • What’s important to keep, to expand, or throw away from the original script’s story? • If the screenwriter is not writing the novelization, how involved should that screenwriter be with the novelist? • What’s the best way to form a partnership between screenwriters and novelists? • What changes should screenwriters be flexible on and what should they fight for? We will answer these and many other questions throughout this book. And here’s the cool part. Since collectively, we have done this on seven projects so far, we have specific examples from our own published work, plus a few works-in-progress. You will get the chance to compare side-by-side script pages to the novelization pages that followed. We will explain our whole process: why certain parts of the novel are faithful to the script and why other parts veer off in different directions. 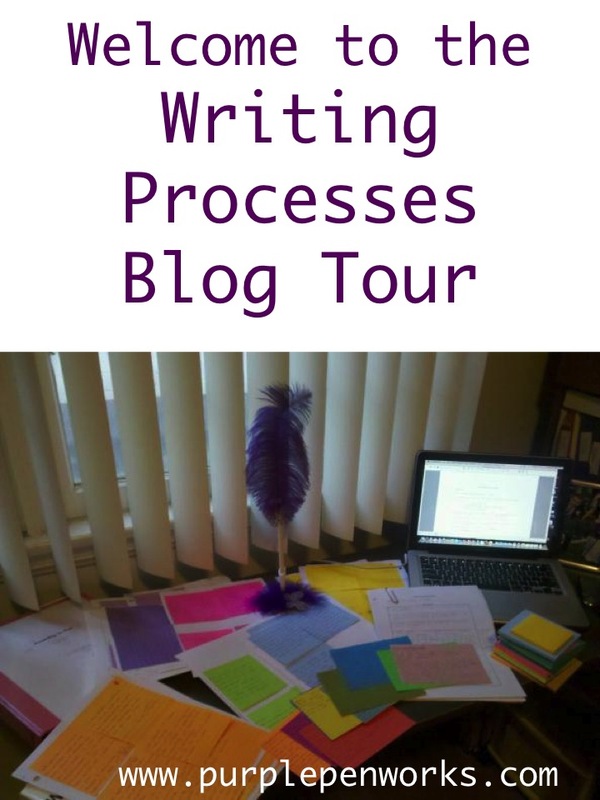 We will show you how each writing arena follows different rules and how to use the tools unique to novelists in the novelization process. For those screenwriters who are also aspiring novelists, there is so much you must learn to do your own adaptations. It’s like having to rewire your brain to think the exact opposite to how it functioned when you penned your screenplay. We will also give you short exercises in select chapters to put what you’re learning into practice. We will cover such topics as setting, length, point of view, backstory, interior monologue, and the translation of dialogue, character, and structure from script-to-book. Are you ready to dive in with us, into this new, exciting, creative world? Novelizations: How do you translate a script into a novel? A writing exercise. Have you ever thought about adapting your script into a novel? Have you wondered how the process of novelization works? Rene Gutteridge and I have done a few of these together, and she’s done several with other screenwriters. We won a Carol Award / Book of the Year Award in the Women’s Fiction category of ACFW, for Never the Bride. I also recently started adapting some of my scripts myself into novels. It’s hard work, but a very fun process. There’s definitely an art to it! It’s exactly the opposite of the process you’d go through to adapt a book into a screenplay (like I did with The Ultimate Gift). And getting your scripts out there as books just might help you get a movie made! And for novelists, you could find some good projects to work on that are about half the work of writing a novel from scratch. The sample included 1188 words, four printed novel pages vs. 472 words and two script pages. That’s two and a half times more words that were put into the novel to describe the same sequence. This novel is in first-person, present tense, which gives us an active thought life from which to play. It’s like getting to write one long monologue as Jessie tells her own story. For this blog, we’re going to focus on interior monologue (the subject of Chapter Six of our new “How To” book), one of the most useful tools exclusive to novelists that screenwriters are not allowed to use in scripts. The novel begins with the scene that starts on page two of the screenplay. It draws you into Jessie’s dilemma in a way the script simply cannot. She may be in the same predicament, but we get to spend a lot more time with Jessie, getting to know how she feels about life, her vulnerability, and her singleness. The interior monologue shares some of the information from the voice-over where Jessie is fantasizing about the life she wishes she had. Her journal habit, her hair color (and lack of blonde hair), what she sees as her ideal life. We find out she’s responsible with her job, is capable of taking care of herself, and how she feels about her boss. Even her boss’s character is set up here. All of this is revealed in the next part of the script, but in the novel this information comes out in the middle of Jessie’s crisis to reveal more about her character and life. The inner battle between her romantic optimism and her realistic cynicism shines through as well. The novel also takes a bit more time to describe the setting and the weather. The interior monologue has a voice. It closely matches the style of Jessie’s voice from the script’s dialogue but is infused with additional humor and an openness you can’t have in a script without access to Jessie’s private thoughts. 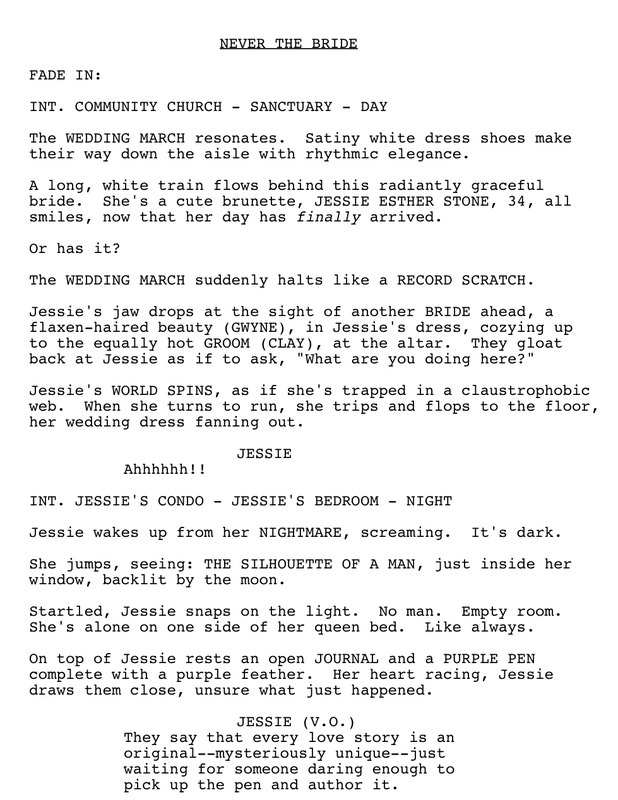 Look at the segment of the script again where Jessie hopes the guy in the sports car will stop to help her. Then read over the novel version for that sequence. Notice the difference. Many of Jessie’s thoughts are shared during the part where she hopes the guy in the convertible will stop. We get to peek into what she’s thinking and feeling while anxiously waiting to see if he’ll help her. In reality, that scene on film would take just a few seconds, even if the director chooses to follow the slo-mo, brunette hair-blowing-in-the-wind dramatics. The novel allows us to pause and hear what flies through her mind in that moment, getting caught up in all her hopes and dreams of rescue. The script version is no less devastating to the character as she’s pelted with muddy water, yet the thoughts we get to read with Jessie in the novel are so enjoyable, so character revealing. We may even feel more for her in this moment because we got to stop and take the time to do so. Interior monologue replaces the visual of the muddy water. In book form, saying she was splattered with water does nothing because we can’t see her reaction to it, as an actress would depict it. So instead we have to go inside her head. The hope in film is that a cute and talented actress will garner some great empathy as well. After the guy in the convertible does not stop and she decides to change her own tire, there is a sequence of her interior thought life about being single. It economically gives us an idea of what this character and story are about, what causes her pain, and she plainly states that she hates being alone. None of this exists in the screenplay, even though viewers are likely to get the same message watching an actress. Those internal thoughts voice the intention of the story of the screenplay, yet the script cannot be nearly that direct. However, notice how both the manuscript and the screenplay are moved forward with action. The novel references the silhouette matching the man who was in her room after her nightmare. This matches the script without going into what her nightmare was about yet. It sets up that she saw this same, mysterious figure before. This sample shows you the same sequence. It’s the same dramatic purpose. However, we traveled different writing roads to get there. This scene is also an example of a change to the scene order (structure), as well as the challenge novelists face dealing with voice-over. This is especially true in this case where the voice-over does not match the visuals; the character is lying to herself about her reality. We deal with all of those special challenges in translating a script into a novel in our book. This has been one sample, but we have many different samples in our new book, Novelizations: How to Adapt Scripts Into Novels. Ever thought about adapting a script into a novel? Since 2007, I’ve been involved in a new trend that takes scripts and turns them into books. Yes, this is the opposite of normal. Many people have asked me how to do it. There are definitely specific writing techniques to this art form that you won’t find in a book on adaptation. In fact, those “How To” books are teaching the opposite rules than it takes to go from script to book. Rene Gutteridge and I have taught classes in this writing technique for novelizations and decided to share what we’ve learned through this book. We took 10+ examples from our script to book novelizations, some published, some works-in-progress, to help illustrate how you turn a screenplay into a novel. 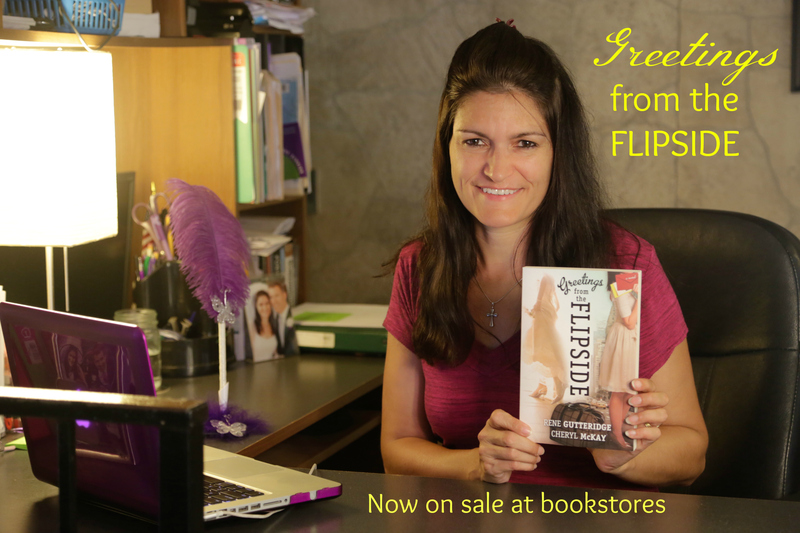 As a screenwriter, it’s been amazing to see my characters come to life in book form. Having a screenplay come out as a book makes it a lot easier to gain attention for your scripts. This book is for screenwriters who want to do their own adaptations as well as novelists who want to understand this unique writing format and how both types of writers can get involved in them. 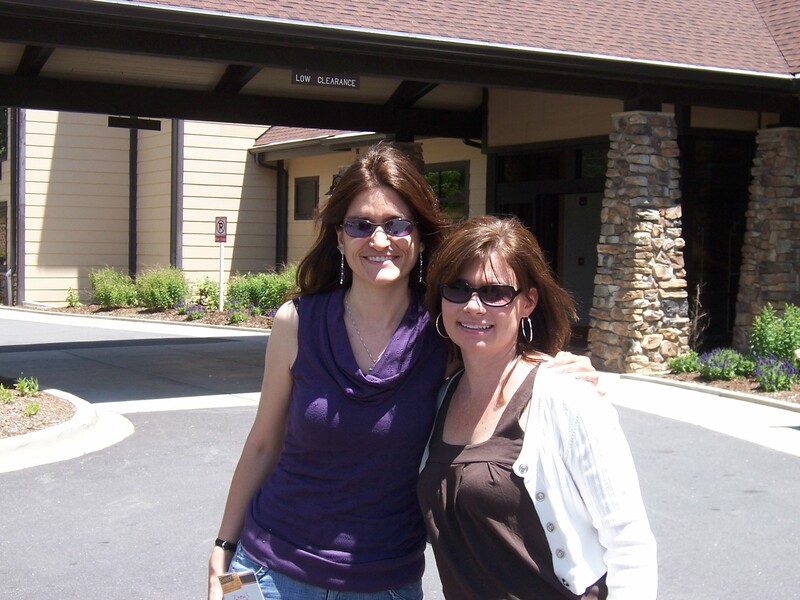 Rene and I first met after Rene was hired to novelize my screenplay from the film, The Ultimate Gift. 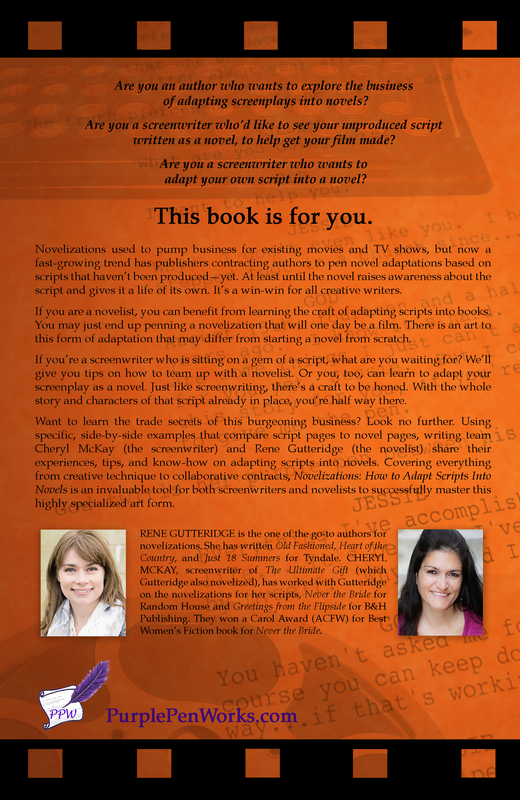 Are you an author who wants to explore the business of adapting screenplays into novels? Are you a screenwriter who’d like to see your unproduced script written as a novel, to help get your film made? Are you a screenwriter who wants to adapt your own script into a novel? Novelizations used to pump business for existing movies and TV shows, but now a fast-growing trend has publishers contracting authors to pen novel adaptations based on scripts that haven’t been produced—yet. At least until the novel raises awareness about the script and gives it a life of its own. It’s a win-win for all creative writers. 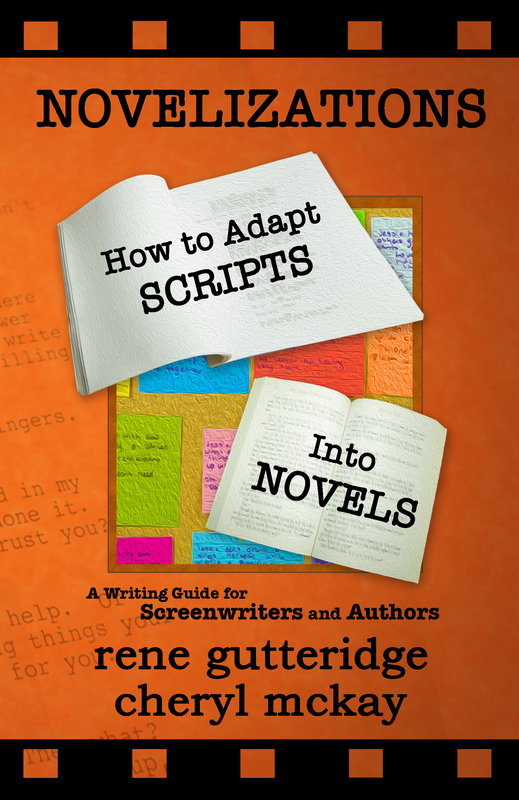 If you are a novelist, you can benefit from learning the craft of adapting scripts into books. You may just end up penning a novelization that will one day be a film. There is an art to this form of adaptation that may differ from starting a novel from scratch. If you’re a screenwriter who is sitting on a gem of a script, what are you waiting for? We’ll give you tips on how to team up with a novelist. Or you, too, can learn to adapt your screenplay as a novel. Just like screenwriting, there’s a craft to be honed. With the whole story and characters of that script already in place, you’re half way there. Want to learn the trade secrets of this burgeoning business? Look no further. Using specific, side-by-side examples that compare script pages to novel pages, writing team Cheryl McKay (the screenwriter) and Rene Gutteridge (the novelist) share their experiences, tips, and know-how on adapting scripts into novels. Covering everything from creative technique to collaborative contracts, Novelizations: How to Adapt Scripts Into Novels is an invaluable tool for both screenwriters and novelists to successfully master this highly specialized art form. RENE GUTTERIDGE is the one of the go-to authors for novelizations. She has written Old Fashioned, Heart of the Country, and Just 18 Summers for Tyndale. 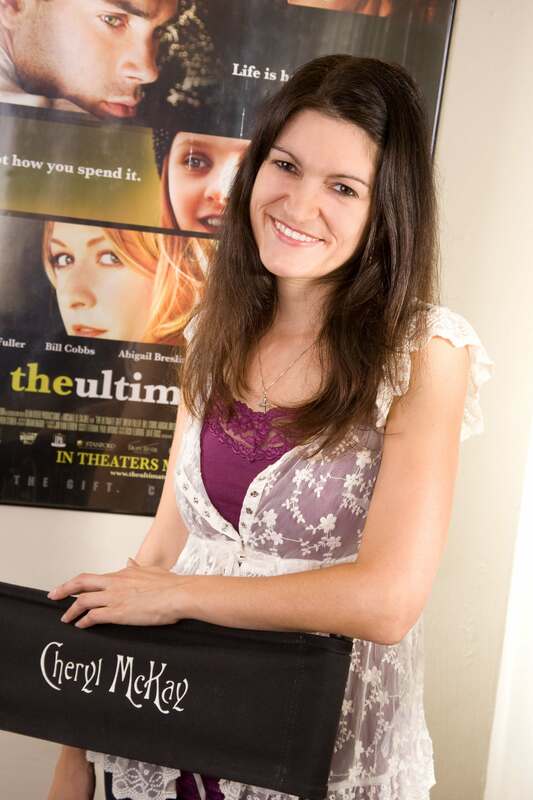 CHERYL MCKAY, screenwriter of The Ultimate Gift (which Gutteridge also novelized), has worked with Gutteridge on the novelizations for her scripts, Never the Bride for Random House and Greetings from the Flipside for B&H Publishing. 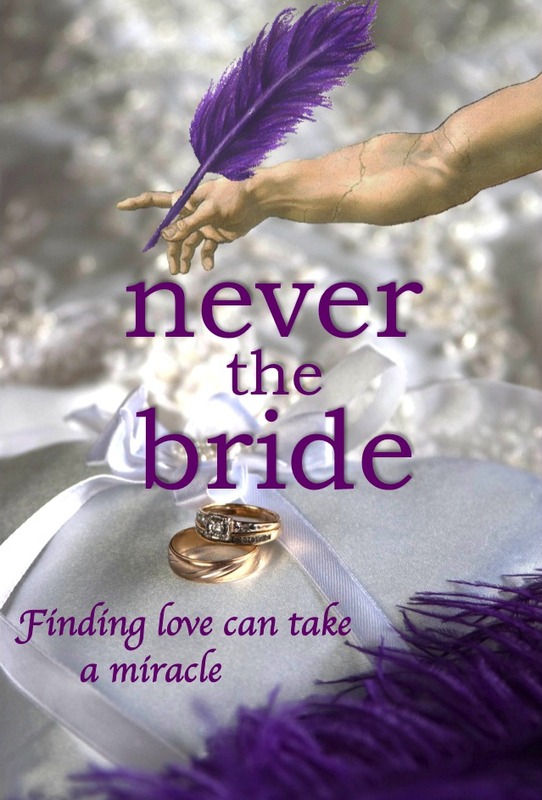 They won a Carol Award (ACFW) for Best Women’s Fiction for Never the Bride. For the month of January, the website called Soul Inspirationz, which celebrates Christian authors and fiction, has decided to feature Rene Gutteridge and me as featured authors.